Elephant 4, Software limiter from Voxengo. Voxengo Elephant version 4.4 is now available, a new version that adds 64-bit AAX support. 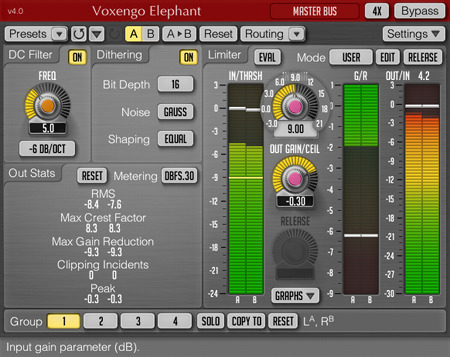 The Voxengo Elephant mastering limiter plug-in has received an update and is now available in version 4.2. New update for the Voxengo Elephant mastering limiter plug-in, which version 4 was released last February. 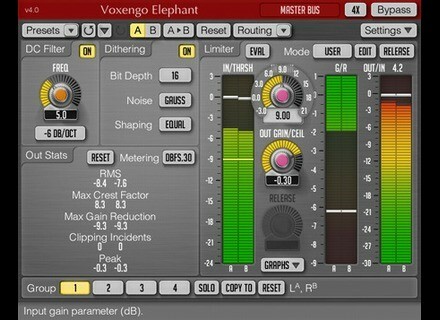 Voxengo's Elephant 4 mastering limiter has been released, promising "transparent" limiting and loudness maximization. Voxengo Elephant version 3.9 update is now available for download. During the period between December 12th, 2010 and December 31th, 2010 Voxengo are offering 10% discount on all software title purchases. An updated version 3.7 of Voxengo Elephant is now available for download. Voxengo Elephant update version 3.6 is now available for download. Voxengo has updated Elephant to v3.3. Voxengo has updated Elephant to v3.2.